When I’m sitting in the kitchen, bored while waiting for water to boil or cupcakes to bake, I like to come up with concepts for dessert projects. I have an adorable little notebook for my ideas and have lots of little checklists of ideas. Yes, checklists. I put little boxes next to everything I write so I can check things off as I make them. I’ve done four so far, out of, like, thirty…and growing. Among the idealistic lychee marshmallow, wine jelly and mascarpone ice cream notations, there are somewhat more simple pages of flavor combinations I find intriguing. I decided to explore one because, well, I realized I had both ingredients on hand. Not as green as I wanted it but oh well. 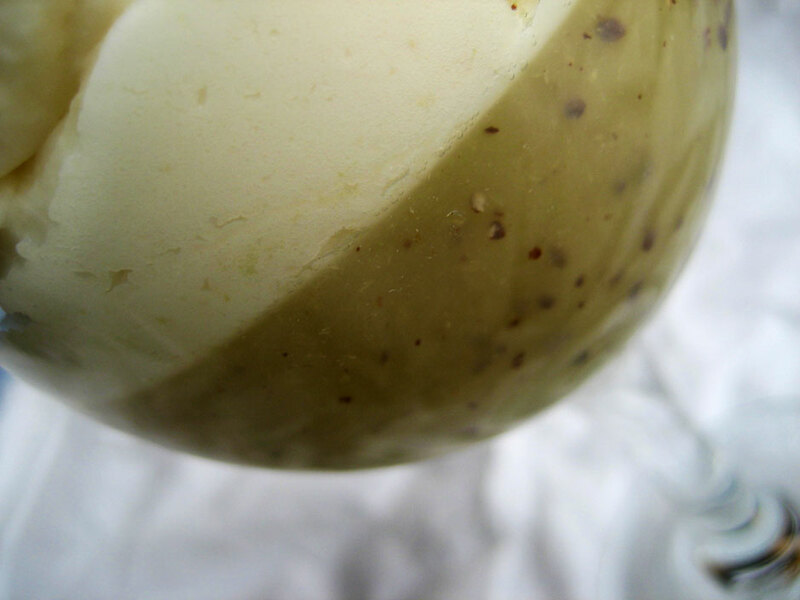 Kiwi and white chocolate sounded like a delightful pairing from the start, and I was excited to see what I could do with it. I’ve been wanting to explore more elegant layered desserts, so I mentioned my idea on Twitter and was soon met with the perfect response from a fellow baker – white chocolate mousse! I am absolutely terrified of the amount of calories in this. Since I love making marshmallows and really enjoyed creating a jiggly-wiggly panna cotta, I decided to play with the gelatin some more and attempt a homemade kiwi jello. You could strain the seeds, if you secretly hate kiwis or something, I guess. It didn’t set up quite as firm as actual Jell-O due to my using puree instead of juice, and was really more like a jelly. 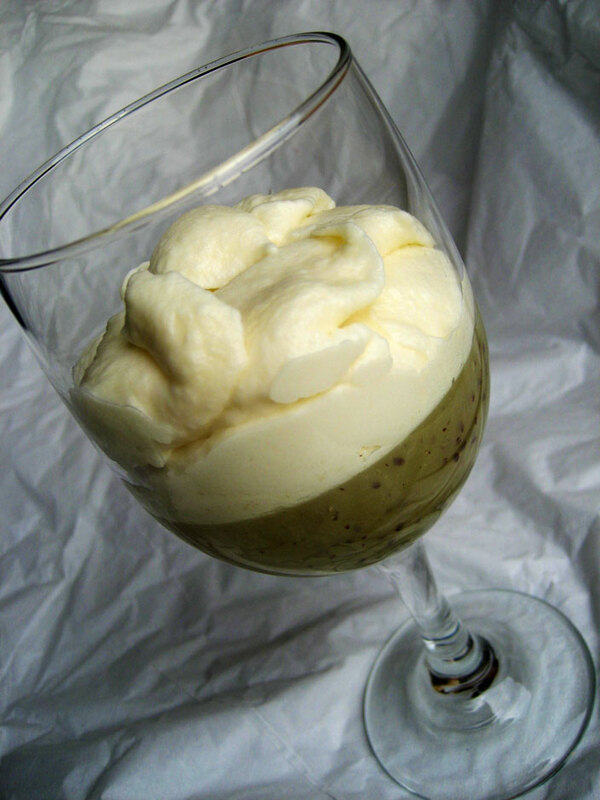 But it’s really tasty – the tangy, slightly sour kiwi jello goes wonderfully with the creamy, smooth white chocolate mousse. You could try adding a little green food coloring to the jello if you’d like it a little brighter. It definitely looks like kiwi, though. Watch for more cold desserts! Peel and chop the kiwis, then puree in a food processor or blender. Add enough water to measure 2 cups, if necessary. Pour 1/2 cup puree into a glass bowl or measuring cup and sprinkle in the gelatin. Let stand 1 minute. Meanwhile in a small saucepan bring the remaining puree to a boil and stir in the gelatin mixture until dissolved. Remove from heat, stir in the lemon juice and honey and pour into serving glasses. Allow to cool, then refrigerate until set (at least 4 hours, up to 5 days). Prepare an ice water bath. In a small saucepan, heat the water and sugar, stirring occasionally, until the sugar is dissolved. Add the chocolate and melt until smooth, stirring constantly. Set pan in water bath to cool, then place in the refrigerator until thoroughly chilled but not set. If it sets up, stir it over low heat until it’s mostly melted but not hot. Whisk until smooth. 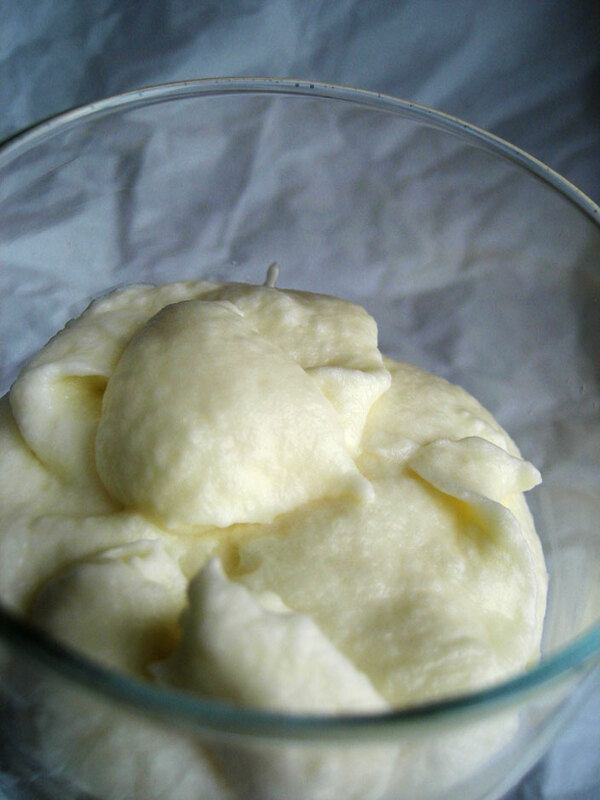 Whip the cream and vanilla to stiff peaks and fold in the white chocolate mixture. Pour over kiwi jelly. There’s a lot more mousse than there is kiwi jelly, so you could either double the jelly, halve the mousse or just do something else with the extra mousse. I put it in a couple extra fancy little glasses and if I do something really awesome with it I’ll post, but right now I’m thinking of just dusting it with some matcha. This looks awesome! 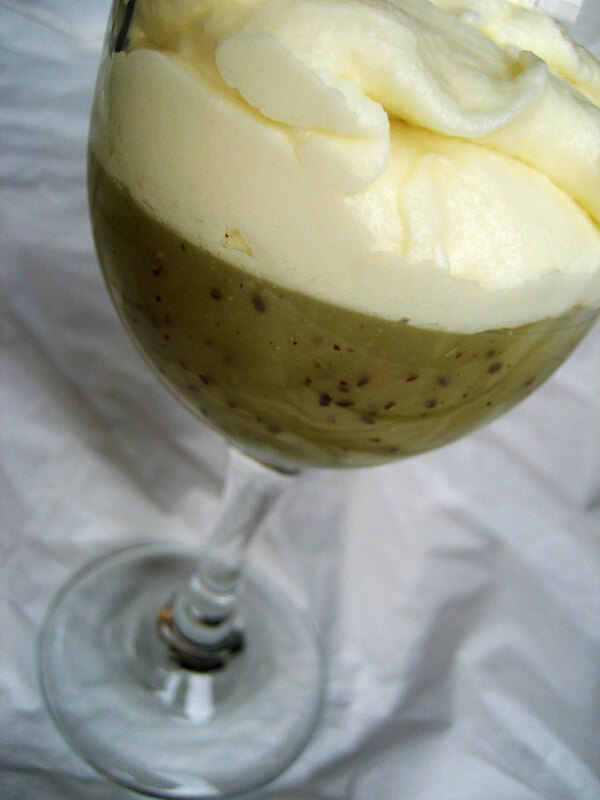 I love the idea of kiwi jello and how wonderful with the white chocolate mousse! anna, you are so creativ! and kiwi is pretty fruit, kiwi jello is a gem! yes! matcha and white chocolate are very, very good friends (http://teaspotnyc.blogspot.com/2009/02/green-tea-white-hot-chocolate.html). i didn’t think this could get more delicious, but that might do it.